Former Causa Justa housing rights counselor Myriam Zamora takes down names of protesters at a 2014 rally against speculation. Photo by Leslie Nguyen-Okwu. A controversial study — until now largely unseen — has sparked discord between the San Francisco Planning Department and Mission District anti-gentrification activists. The report, completed in early June by a UC Berkeley Ph.D graduate student in economics named Kate Pennington, asserts that the probability of being legally evicted does not increase for tenants residing within a kilometer of new construction in San Francisco. In some cases, the study concludes, new construction might actually decrease the chances that a legal eviction notice is served in its close proximity. The study’s conclusion is anathema to the deeply held beliefs of Mission anti-gentrification advocates, whose everyday work is based on the notion — which they say is supported by a preponderance of anecdotal evidence — that new market-rate development is a driver of displacement. So it is not surprising that Mission District activists have come out swinging. And, coincidentally or not, the report has yet to be widely released or publicized by the city. Planning Department spokeswoman Gina Simi, however, denied that the city has buried the report. Rather, “the department does not have a practice of making intern projects publicly available.” To obtain a copy of the report, one would have to know of its existence and request a copy, as Mission Local did. The study’s critics have complained that it is “incomplete,” only a “draft” and does not differentiate the racial and economic status of evicted tenants. “What they’re studying is legally noticed Rent Board evictions, and that’s a very narrow slice of the displacement pie,” said Peter Papadopoulos, a policy analyst with the Mission Economic Development Agency, a nonprofit that works with residents and small businesses, and also acts as a housing developer in the Mission. The Planning Department, however, is standing by the study. Nobody denies that the report focuses exclusively on legal evictions — which, while only one measure of displacement, is often used in studies such as the Anti-Eviction Mapping Project and various others. “Ms. Pennington’s work is important and high-caliber,” AnMarie Rodgers, the director of citywide planning, wrote Mission Local in an email. Pennington’s analysis is narrowly focused on whether new construction increases the likelihood of receiving an eviction notice. She drew data from eviction notices submitted to the San Francisco Rent Board as well as those filed with San Francisco Superior Court from 2003 to 2017, and then matched them up with projects constructed in the same period. She tested for three variables: whether evictions are influenced by proximity to the project, neighborhood characteristics, and whether the project is market-rate or affordable — all over the five years before and after a project is built. Furthermore, Pennington found that a unit located within a quarter-kilometer of a new project is a quarter of a percentage point less likely to receive an eviction notice three years after the project was built. “This offers evidence of a mild supply effect, with building more housing helping to reduce the likelihood of legal eviction over time,” Pennington writes. Anti-gentrification activists are not happy with the study’s conclusions. Market-rate development “contributes to direct displacement because landlords cannot resist the lure of higher rents and therefore employ various means to get tenants out … ” Scott Weaver, a lawyer for the merchants association Calle 24 wrote in a May 16 letter to Planning Department Director John Rahaim. The letter essentially warns that the city department might humiliate itself by focusing on such a narrow set of data. “Reliance on Rent Board Notices in making any conclusions will cast serious doubts on this study,” Weaver wrote. Alternately, Pennington’s report could serve as a cudgel for the city’s YIMBY (Yes In My Back Yard) faction, which fervently advocates for a glut of new construction at all levels of affordability. This is not the first time the Planning Department has heard this complaint. The department, in fact, consulted with these very activists about the study as it was being conducted. Their concerns, throughout the process, were the same: The study is too narrowly focused and leaves out those who might be disproportionately affected by evictions. 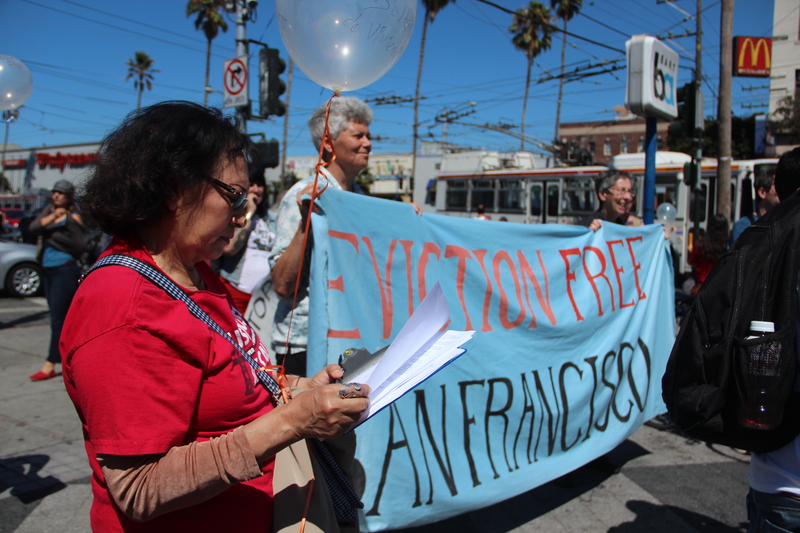 Pennington’s report, titled “The Impact of housing Production on Legal Eviction in San Francisco,” is a contribution to an ongoing — and extremely heated — debate over whether the construction of market-rate housing contributes to displacement amid an ongoing housing and affordability crisis throughout the Bay Area. It builds on previous studies that assert new construction does not contribute to gentrification and displacement — in particular, a 2016 study by the UC Berkeley Urban Displacement Project that, in part, concluded that market-rate development had an “insignificant effect on displacement,” as well as a study by the California Legislative Budget Analyst that the construction of market-rate development is the best solution easing displacement pressure on low-income households. Although these studies concluded that new residential development does not contribute to displacement — and actually eases housing prices at the regional level — neither one measured the so-called “spillover” effects of new development at the neighborhood level — meaning whether the neighborhoods are distinctly impacted by new construction. That’s where this most recent Planning Department study comes in, measuring the probability of legal eviction notices near new development at the block-to-block level. In addition to their complaint that the study potentially negates disproportionate hardships heaped upon poor minorities, activists also say the study is based on incomplete data. Weaver, the Calle 24 lawyer, noted that the study does not measure the “nonpayment” evictions that are not submitted to the Rent Board. “These non-payments (evictions) constitute anywhere from 40 percent to 60 percent of all just-cause evictions and more likely disproportionately impact poorer communities,” he said in an email. Pennington says Weaver is correct that not all nonpayment evictions were measured in the study, since many of them are not documented. However, she says some 5,000 of them were included, as they were either filed with the Rent Board or included in court filings. And Pennington stressed that the study does not claim to capture all forms of displacement. The paper, she said, focuses on just one thing: the effect of new construction on legal evictions. She said she intends to expand on the study by tracking the effects of new development on neighborhood-level rental prices — one of the indicators her critics felt was missing from this first study. That research, she said, is already underway. MEDA / Popadopoulos like Trump fearful of science…..
science isn’t about looking at a small sampling of data to support your hypothesis. This science doesn’t count. That science doesn’t count. But our conclusions are sound, and based on anecdotes?? Seriously? And now on top of that, MEDA says eviction for not paying your rent-controlled rent is caused by new construction as well? Come on people. What’s been clear for years to anyone with any sense, is the twisted “logic” of SF Progressives is counterproductive to the goals. Not sure what your cutoff for small sampling is. The study was pretty comprehensive with the data that is publicly available. Hope you haven’t run a cancer study in the past otherwise we would probably still be using herbs and shark soup to cure leukemia. Activists will not know what to do with themselves if the study shows that rents actually decrease with new developments. The study does not claim that rents decrease with new development. Washington Post however shines light on a study that shows the only rents that are affected by market rate development, are other market rate rents (ie it doesn’t trickle down). When you ask a question in a dumb way you get a dumb answer, like this report. first, most “for cause evictions” are for non-payment of rent or lease violations about the conduct of the tenant or their use of the apartment. except for some small fraction, those cases would be generally unrelated to what is going on the surrounding neighborhood. so including that irrelevant data in the analysis just ruins it. and evictions resulting from Owner Move-In will be widely distributed throughout the City as well (except for the fraudulent ones, but that can’t be tracked from the data). the evictions that are directly part of the gentrification process are most of all Ellis Act and Substantial Rehab evictions. Those are the two big tricks “investors” use to get tenants out and flip apartment buildings into TIC’s or up-market rentals. This shallow “study” did not disaggregate the eviction data, and instead just very dumbly assumes all evictions are equally significant to the question of how neighborhood transformation via new development impacts existing tenants. it also does not “control” for the relative increase in market values from one neighborhood to another. that is, does a bigger jump in market values over years in gentrifying neighborhoods exceed the citywide average, which could create a relatively greater incentive for such predatory “investor” eviction activity? This might be particularly true is a “hot” neighborhood like the Mission. And finally, there is just not going to be very much new development in most of the city due to the zoning limits, but there will still be lots of evictions for all causes in the existing rental housing there. so of course that strongly biased the citywide correlation to ‘no linkage’. the study that is needed would be limited to the neighborhoods – the actual rental market districts, not just a block next to a new project or within some arbitrary radius – where significant new development is actually happening, and just the “investor”-driven Ellis Act and Sub Rehab for-cause evictions therein. a different analysis also would look at just the evictions for non-payment of rent and see if there is a correlation between those numbers and the relative increase in market rents in that neighborhood over time. the question is whether the difficulty of paying such ever-increasing asking rents resulting in more households failing to be able to do so after they move into a unit they can barely afford, if at all. this is a very good question, for example, for the central city’s residential hotels where rents have zoomed since the 1990’s. and that is a very specialized sub-market, by the way, that would likely be least impacted by nearby new development, because the economic factors setting those rents are driven by other considerations. That’s a lot of words, but your first premise is wrong. This study did not just include ‘for cause evictions’ as you erroneously state. So the rest of your post is pretty meaningless. Why would anybody take seriously “a preponderance of anecdotal evidence”? I’m sure the “scientists” at Exxon have a similar body of “research” around climate change. Maybe these activists should consider a part time job there to help make rent. “Preponderance of anecdotal evidence” is MEDA’s way of saying climate change is fake cuz winters out east still has a lot of snow. Housing development, and greater diversity economic and otherwise will save the mission from further rolling to slumhood. I support gentrification and if folks can’t afford to live in the mission or the city too bad. Also let’s rename the Mission and call the neighborhood the American. If the system only allows for two outcomes – slums or gentrification – then there’s something wrong with the system itself. “If folks can’t afford to live in the … city too bad”. What happens when all the low wage workers that provide the goods and services that high income folks demand are no longer able to live anywhere near where they work? And if folks can’t afford to live in the mission, then how does that equate to greater diversity? I am curious if the study examines the amount of rent controlled units lost (condo conversions, teardowns etc). near market rate developments. In those cases, you almost wouldn’t need to know whether someone was evicted or not to say whether new developments accelerated gentrification in a neighborhood. Luddites will never believe facts or science. It signals clearly that the Calle 24 is nothing but a local rent-seeking organization that bullies businesses while claiming to represent minorities. They only act in their self-interest to protect personal property values. If they really cared about minorities, they’d fight for more housing, not less. Why should the Mission be oversaturated with luxury housing? Calle 24 and other Mission organizations, including MEDA, have consistently called for more affordable housing in the Mission. That consistent voice has resulted in more affordable housing dollars for the Mission. Let’s talk about the creation and support of that development and investment pipeline. If the Sunset or West Portal or Marina were targeted in the same way the Mission has been, the neighbors would be fighting to protect those neighborhoods as well– with a call to balanced housing development. Is it ever possible to build enuf cheap housing (housing that is paid for – not by the inhabitants – but by others) in one of the most expensive places on earth? 17th & South Van Ness. I rest my case. What people fail to realize is that the Mission is already a hot neighborhood whether new construction happens or not. When you have rent controlled tenants and double digit percentage increases in rent, there is ALREADY an incentive to get them out. It doesn’t matter if a new apartment building goes up. Those new buildings are coming up for the same reason people are getting evicted – there is a market willing to pay through the nose to live in the Mission. The study aligns with my perception in that new residents with money would rather live in a new build (thus new construction seems to very marginally decrease chance of eviction) but they will still pay a lot for a sub-par property that would normally go to a lower-paying tenant if there isn’t another option. The philosophy of MEDA and their ilk of new construction exasperating gentrification might have some merit if the Mission were a neighborhood that people with money were afraid to move into (like a Bayview-type scenario). In that case, I can understand that seeing some new buildings might help dubious investors feel safer about over-paying for property but ultimately I don’t see how any one could argue the simple fact that gentrification in SF and the Bay Area is really simply about a lot of money (for some), a lot of jobs, and not enough housing. I think it is definitely worth investing in protections for tenants but this needs to be paired with a lot of new housing construction – both affordable and market-rate. Maybe a quibble, but I think your phrase:”YIMBY (Yes In My Back Yard) faction, which fervently advocates for a glut of new construction at all levels of affordability.” might be overstating the case. Glut: an excessively abundant supply of something. I think most YIMBYs would be delighted with enough rather than “excessively abundant”.